Probate is the legal process used to distribute a person’s property after their death. The person’s assets are inventoried, properly documented debts are satisfied and any remaining property is delivered to the person’s heirs. If a person prepared a Last Will and Testament, it names their heirs. If not, Florida law provides basic instructions for distribution to the person’s relatives. Some probates involve the service of a Personal Representative, a person appointed by the Court to handle the Estate’s administration. Most probates are not contested and few involve adversarial proceedings or litigation. An abbreviated form of probate, with no Personal Representative, and is only available for Estates valued at $75,000.00 or less, excluding the value of an exempt homestead. The process results in an Order of Summary Administration authorizing the distribution of the person’s assets to their proper heirs, subject to payment of any proper Claims against the Estate. The Order is usually entered several weeks after the date of filing, but before the file may be closed Notice of the proceeding must be published and a ninety (90) day delay allowed for exclusion of any creditor’s Claims that result. The standard form of probate in Florida, required for Estates valued at more than $75,000.00 or any which require unusual activities in the course of the Estate’s administration. A few weeks after filing the Court appoints a Personal Representative and issues Letters of Administration. The assets of the Estate are documented in an Inventory, Notice of the proceeding is published and a ninety (90) day delay is allowed for exclusion of any creditor’s Claims that result. Once the creditors’ Claims period has expired a Final Accounting is prepared, proper Claims are paid and distributions are made to the appropriate heirs. A special form of probate used to distribute a non-resident’s Florida property. The usual procedures are slightly abbreviated, additional steps must be taken to interact with the foreign jurisdiction where the decedent resided. Demand for Accounting – the heirs, as well as any unpaid creditor, are entitled to an accurate Accounting and may Object to any discrepancies. Breach of Fiduciary Duty – a Personal Representative must properly discharge their duties and may be accountable for improper actions or failure to perform a necessary act. Elective Share Determination – unless forfeited in a valid nuptial agreement, a surviving spouse in Florida is entitled to at least 30% of an estate. 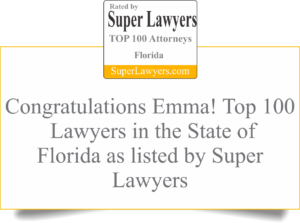 Call the Law Office of Emma Hemness. We can help you: Avoid probate, avoid worry, avoid death taxes, avoid estate taxes, with frozen accounts, probate court, will contests, contested wills, disinheriting, inheritance, and homestead. Is privacy lost during the probate process? How long does probate last? Call us to find out.